It's no secret that the Age of Intelligent Marketing is here. Marketers are leveraging artificial intelligence to personalize interactions and gain actionable insights needed for sales to close more deals. However, with marketers using 21 or more digital marketing products, they are often faced with disconnected tools that make their jobs harder. Thankfully, it's doesn't have to be this way. 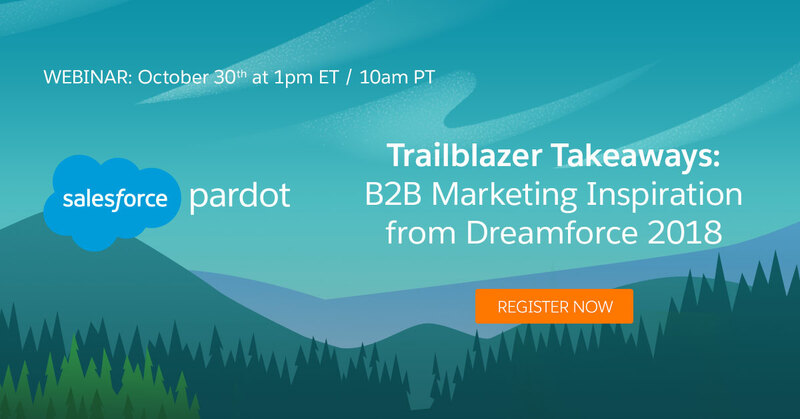 Join us and our Trailblazers in B2B Marketing as we share how Pardot customers are transforming their organizations with AI, Analytics, and Account-Based Marketing all on one platform. Hear how our customers are thinking about the future of B2B marketing and learn about our latest innovations as we share our biggest takeaways from Dreamforce 2018.